Wow. We have been on a really good run of restaurants of late and Peppercorn @the civic is no exception. This joint is our new favourite Thai restaurant, although it’s really more Laotian. Our run of visits to good restaurants is partly due to some great apps on the market at the moment. We have used Pokitpal a number of times lately, no vouchers needed, just visit one of their venues use your registered mastercard and the discount amount will be credited to your account. This app is ideal for a business lunch situation. Peppercorn restaurant is situated upstairs of the suave Civic hotel, close to World Square and Thai Town. We visited on a Friday night, the restaurant had a great atmosphere and was a hive of activity, with many groups enjoying a meal. 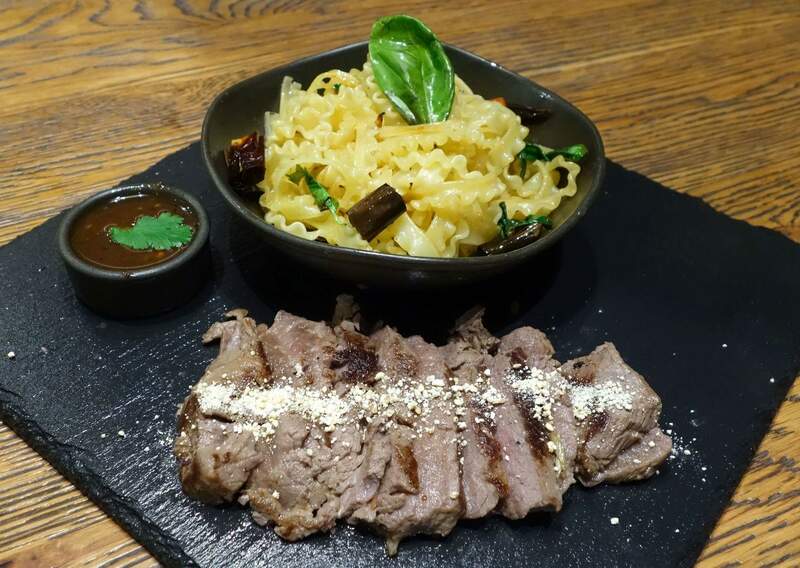 The restaurant is described as Thai, however having recently visited Laos, we noted many of the dishes having Laotian influence, which is not too dissimilar given the Geographic location. 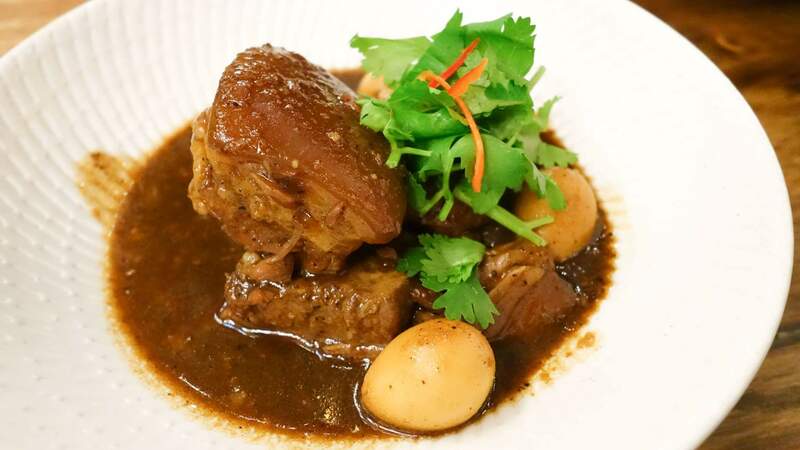 The menu has a number of Thai favourites and a heap of tasty Laotian dishes to add to the excitement. The meals all perfectly prepared. Seriously, you would be hard pressed finding a meal with more flavour anywhere in Sydney, the taste buds were in overdrive at this restaurant. We ordered a couple of meals to share. The spicy crispy pork belly was a cracker of a dish, flavour exploding in our mouth and a good chilli kick with lemongrass, kaffir lime leaves and phrik khing curry paste. This dish is perfect for downing a few beers to quench the heat. 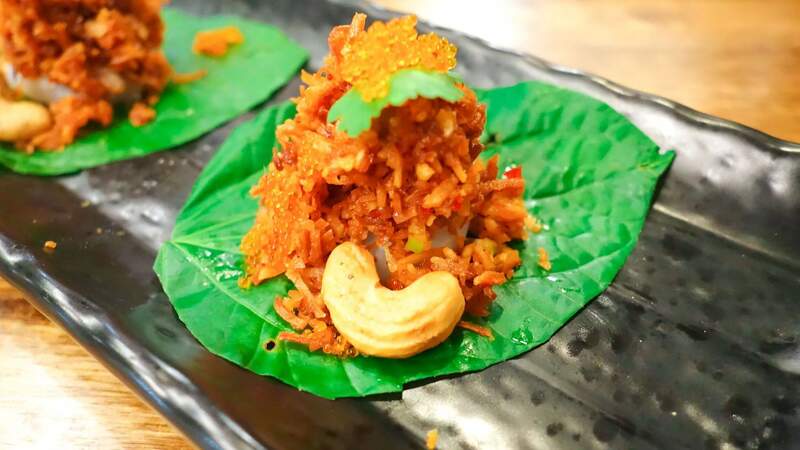 The crispy rice salad was a standout, a mix of textures including the freshness from the mint leaves and lettuce cups, crunch from the crispy fried rice and peanuts the dish flavour enriched with crab meat, cured pork, curry paste, kaffir lime leaves, chilli, coriander and shallots. We simply couldn’t visit this restaurant without ordering a curry. The red curry, crispy skin duck curry with crispy basil was spectacular. 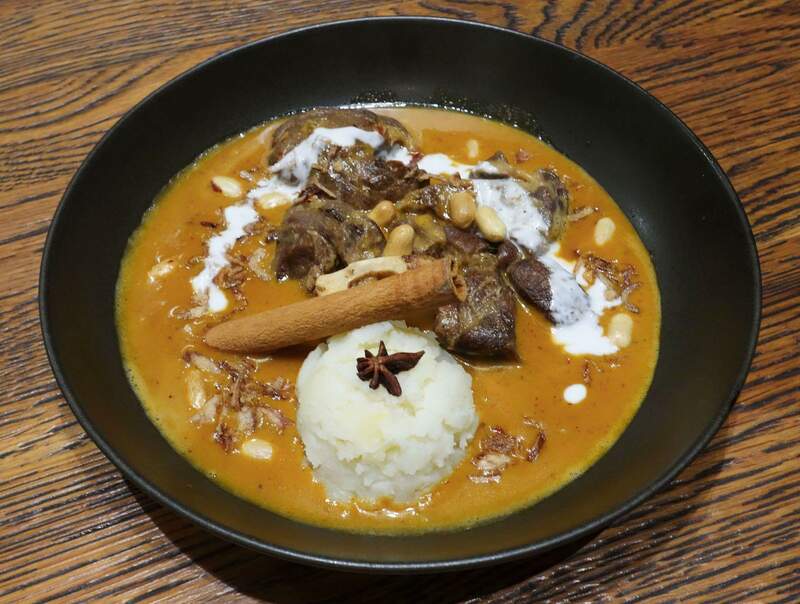 A rich, yet sweet curry with succulent duck. We bypassed a side of rice and went with Roti, this fluffy, crisp flat bread is always a winner when enjoyed with a curry. A return visit is definitely on the cards, so many great menu items to conjure memories of our visits to Laos and Thailand. The service was super fast, the food ridiculously good and prices reasonable for the quality food on offer. Beneath the simple allure of Abb Air’s menu lies a multitude of flavours, each with its own story. The recipes of Abb Air have been passed down through generations preserving the traditional Thai taste. Using fresh herbs, authentic spices, fresh ingredients and exotic seasoning, they redefine traditional dishes to ensure all customers receive an unparalleled Thai dining experience. In Thailand, there is no such thing as a starter, main or dessert. There is also no one person at the table a dish belongs to. The number of dishes ordered equal the number of diners sat down to eat and everything is shared and enjoyed together. Chef Oliver, Chef Aoody, Chef Prem have combined decades of experience, a fountain of knowledge and heart into creating the contemporary Thai menu. A trio of ‘Chef’s Recommendations’ showcases the cohesiveness in their respective specialities and experience. The Chef’s Recommended dish is called “LOVE” – a crab stick roll with enoki mushroom and fish wrapped in seawood and jeweled with salmon roe – the combination of flavors living up to the expectations of the art form that’s served to the table. Freshness of the seafood and smokiness in the mushroom ends with bursts of roe. The dish living up to its name in taste and also beauty. The pork sausage is lean weaving in gluttonous rice, while the chive dumplings are crisp on the outside and topped with deep fried garlic and was a great accompaniment. A selection of mains revolve around heat. Papaya Salad and the Red Duck Curry were beautifully executed, much in the same way you would expect on the street stalls of Bangkok, balanced out with the original fried rice. There’s something classy about soft shell crab with crispy fried greens, taking street food to a new level. The Hotpot is the essential winter warmer, a broth that’s prepared for hours with mixed seafood absorbing that intense flavor. A luxurious velvetty theme of Pandan, a lime coloured asian vanilla flavour that themes their desserts and some of their ice tea. The communal dining experience, the social nature of Thai people embodied by the staff and it’s central location in World Square make it a great meeting point for a catchup while enjoying over modern interpretations of Thai classics. Now anyone who knows me, knows that (a) I don’t try to cook & (b) when I try, I am terrible. However, I was in Thailand and thought it would be a fun experience to learn. I was apprehensive about making three dishes in 1.5 hours from scratch knowing my cooking abilities, especially when thai dishes have about 20 ingredients per menu item. But I do recommend you participate in a class as it is much easier than you first think, it is enjoyable and you might just prove yourself wrong, like I did. Kata Thai Cooking Class by Sally is located in Kata, just on the hill as you head down into town. Open Monday – Saturday, they offer a morning (11am-1:30pm) or an afternoon session (3:30-6pm) for approximately $1700 Baht (at the moment that’s around $70). The cost includes the ingredients for cooking including meat, a cooking station, recipes, chefs hat, the meal, a soft drink & water as well as the chef’s time. It also includes free transport if coming from the kata and karon area. Sally was in Bangkok for a work conference/cooking seminar so her business & life partner Jim taught my class. The class can be mixed in numbers depending on the day, sometimes big and sometimes small. On the afternoon class I visited, I was the only one there, so it was especially good for me to learn. It has a table set up to prepare the food and workbenches to cook the meals once preparations have been finished. The menu options change depending on which day you visit, but they are predominately popular thai choices like a Red or Green Curry, Massamun (though as I learn, this isn’t typically Thai), cashew nut chicken, tom yum soup, pad thai and spring rolls to name a few. The classes are also possible for vegetarians as the choices can be adjusted. Jim is entertaining and I find his banter most suitable to the experience. He quizzes me on each ingredient before explaining what it is, a little bit of the history and how the ingredients grow and where they can be found. What I find extremely interesting is that you simply swap out a few ingredients only and you’ve got yourself a whole new curry. Basically, you prep the ground work and can make 3-4 different curries at home. For example, basically the difference between a green and red curry is the green uses green chilli (not dried) and the red uses dried red chilli for the paste. Then for a green curry you also add dried roasted coriander seed, cumin seed and a basil leaf. That is the simple difference! A penang curry is similar to the green without the basil leaf and add more green chilli. So I begin with the Red Curry, and after we’ve discussed each ingredient, I soak the dried chill in water, then pound the dried chilli, black pepper and salt, followed by the galangal, lemongrass and a skin of kaffir lime. Later, add the garlic, shallot, turmeric and add the fresh chilli and shrimp paste (keep the paste out if vegetarian). It is awesome that you are making your own paste. You add as much chili as it pleases your taste buds. Once this is done, you can cook. Jim took me to the cooking station and taught each step, one by one. I heat up the vegetable oil, add the coconut milk and dissolve the curry paste, once it starts boiling, pour the rest of the milk in. Add the meat, veggies and wait until it thickens. It was interesting to cook as I was able to watch the curry thicken and taste the flavours as they developed. Once it was cooked, it was served in a bowl and ready to eat, they provided some rice too. I wasn’t a fan of the thai eggplant and probably at home would use carrot or broccoli. But the taste of the red curry was superb and despite it’s colour, really wasn’t that spicy at all. The chicken cashew nut is my favourite. A very easy one to make – prepare your ingredients and chop up the vegetables. At the cooking station you lightly fry your nuts and chilli and remove, then add and lightly fry your chicken. Add your sauce (fish paste, chilli paste, water and sugar), as well as all your other ingredients and it is ready in no time. Garnish with nuts and dried chilli and it’s ready to eat. This had a beautiful taste and so much better than ordering from the store. The last dish was the pad thai. Also, very easy to make once you know how. The noodles had been previously soaked and softened and so then prepare all your ingredients to cook. The sauce is made with tamarind paste, fish sauce and palm sugar. When you’re ready to cook, remember this takes a lot of tossing the noodles to get it all to mix without breaking the noodles. This dish has egg, tofu and I had shrimp. It can be vegetarian if you please. Once it is ready, top it with chives and serve. Another delicious meal. I thought the whole experience was wonderful. It was great to learn about Thai cooking and how to make the meals from scratch, in particular the curry pastes, prepare the ingredients and make step by step. Jim was a great teacher and made it an enjoyable cooking class. I’ll probably go home and make some thai food when I have time (you can even freeze your curry paste to use later if you are time poor)! When you come to Thailand, I thoroughly recommend this as a worthwhile activity. 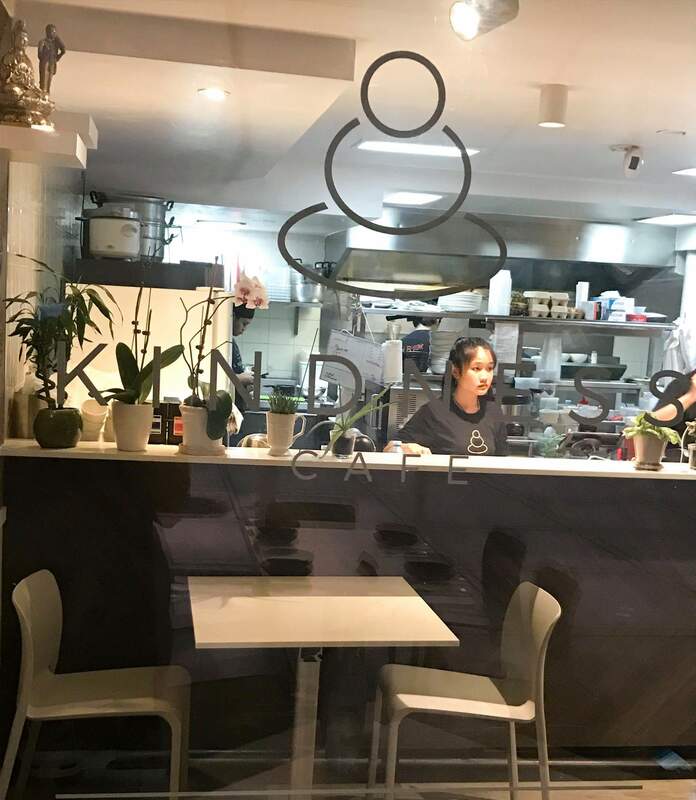 Long Kin is a Thai restaurant in Pymont run by husband and wife team, with Sutee running front of house and his wife Suweena running the kitchen. 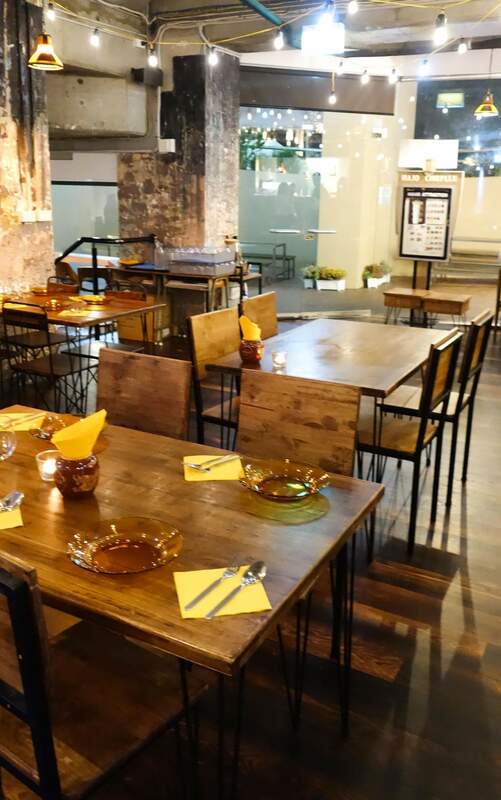 The restaurant has a clean modern fit out scattered with some quirkyness. 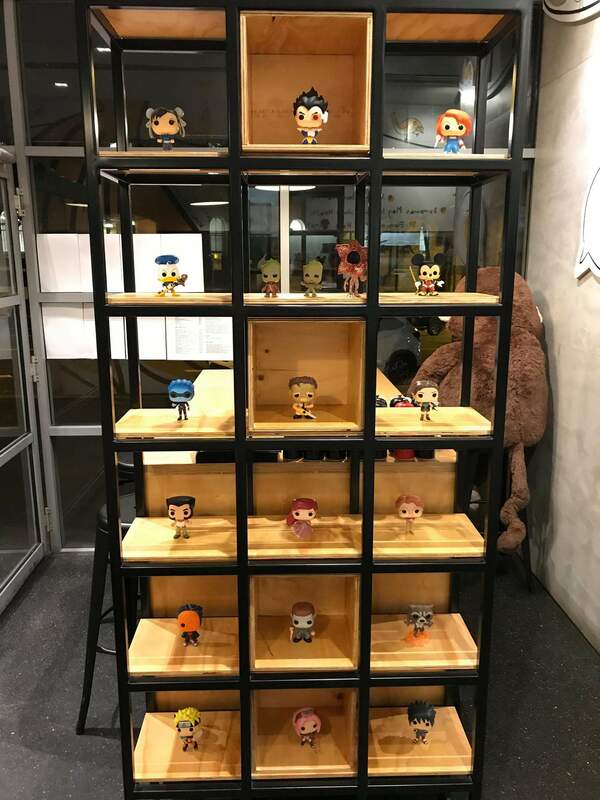 There are monkey figurines displyed on shelves with monkeys and bananas decorating the walls, along with some fun facts about bananas. So it goes Mr loves bananas and she loves monkeys. 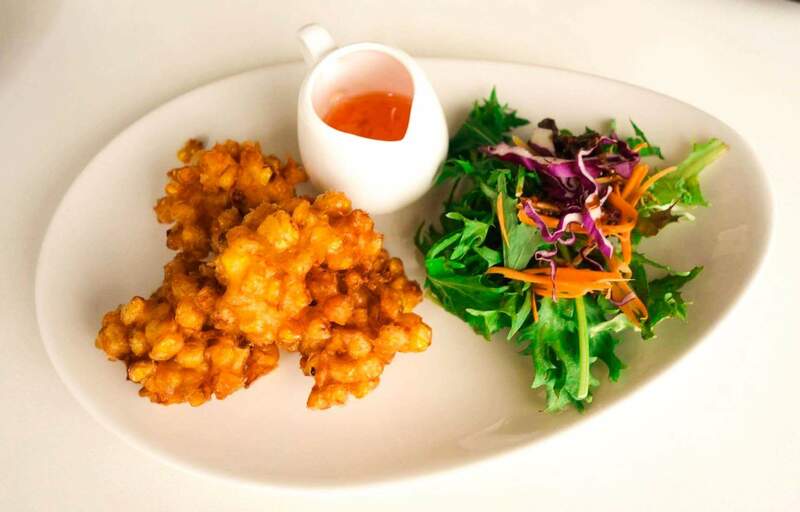 The Long Kin menu is extensive, with some beautiful traditional Thai cusine and some dishes with a fun twist. A great place to visit as a group, as we did on this occasion. 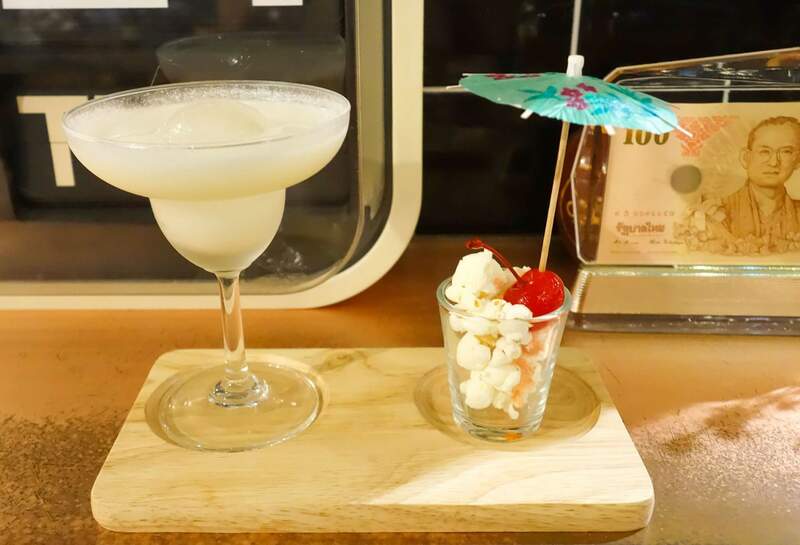 Long Kin is a licensed venue and had a magnitude of choice including cocktails, mocktails, frappes, fresh juice and coffee options. With a range of nice mojito’s. 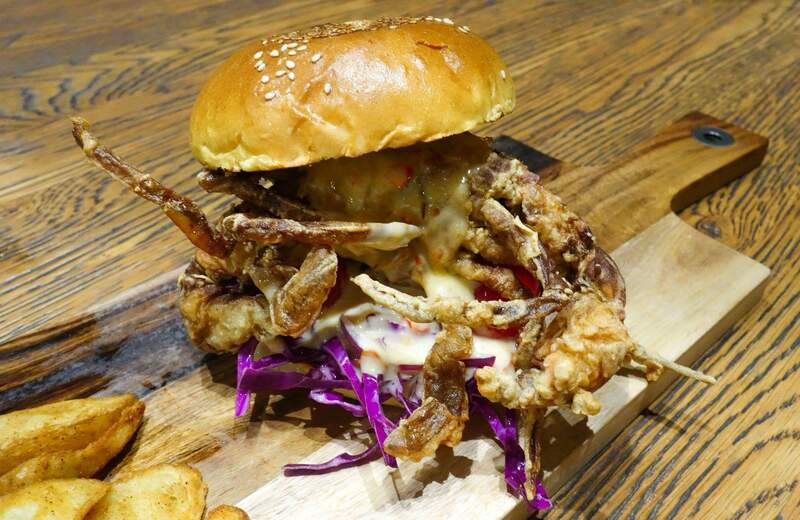 The crisp soft shell crab burger with a thai slaw and mayo is a great option if you are after a quick bite to eat. This was off the specials menu. 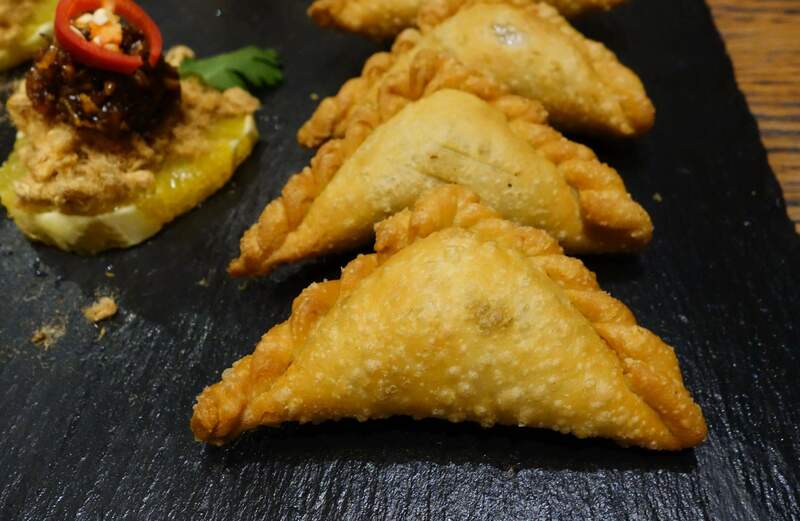 For starters: the curry puffs are always a go to and these did not disappoint. 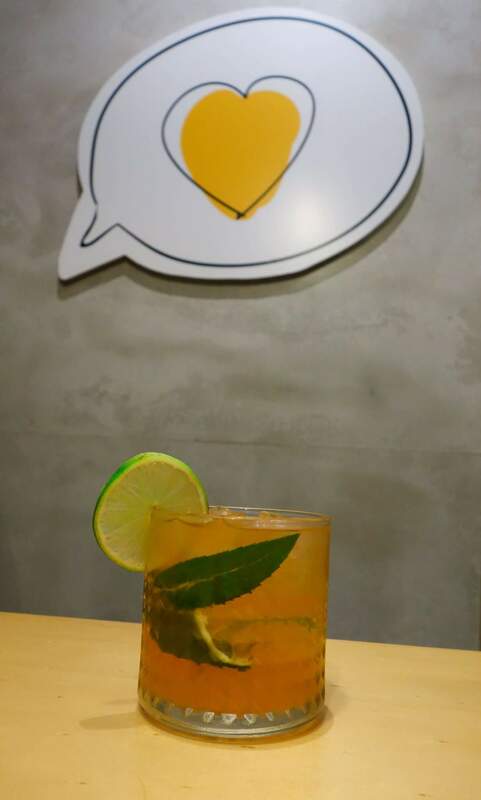 For something different, try the ma hor citrus; a full flavoured bite with pork floss, caramel coconut, peanuts and tamarind sauce atop of a slice of orange. It was a cold night so we opted for some soup. 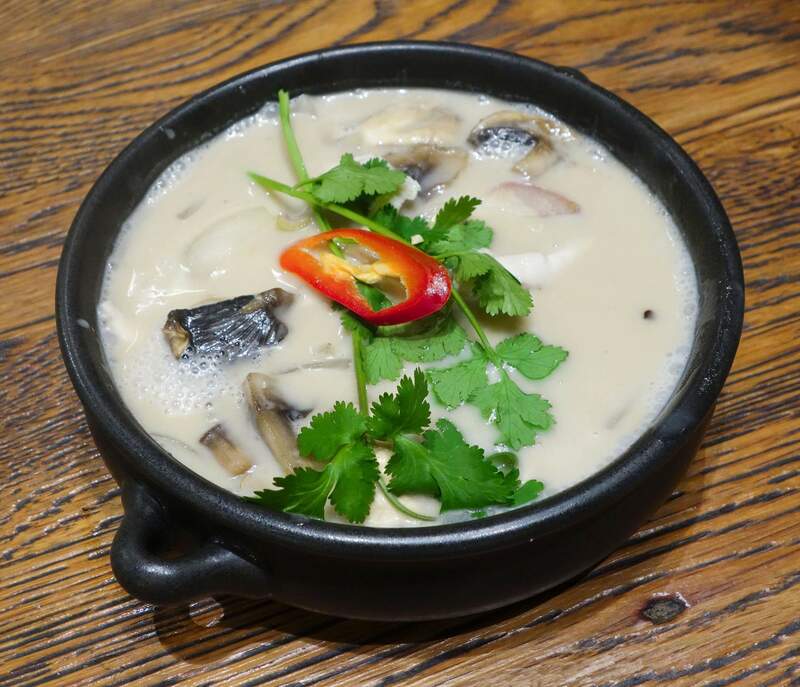 The usual go to is the tom yum, but on this instance we went with the tom kha kai and are now converted and will return for more. This was chicken in a coconut curry sauce. Another winter warmer was the massman osso bucco: a hearty curry with great flavour and meat so tender it pulled apart with the spoon. Have this with a side of rice to savour the sauce. A standout for all was the roast duck noodles. A beautifull cooked piece of duck Maryland, had our mouths watering. 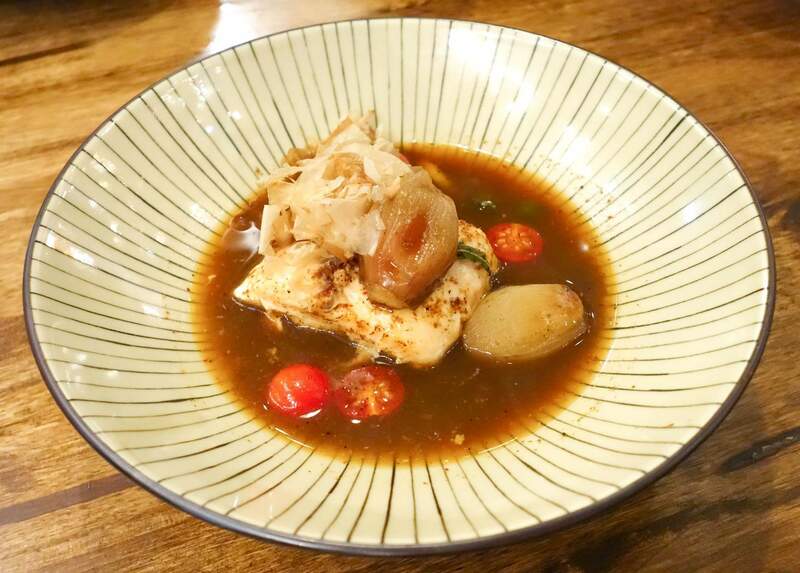 Served atop of a flavoursome broth. For a dish with a twist we shared the fettuccini crying tiger beef with spinach. Tender sliced beef with a good chilli kick from the spicy sauce. Thanks to Long Kin for the flavoursome food and welcoming hospitality that thai’s are known for. Thank you Ompty for inviting us, we will be sure to return. Situated on Oxford St across from Hyde park is Ohbar Thai restaurant. 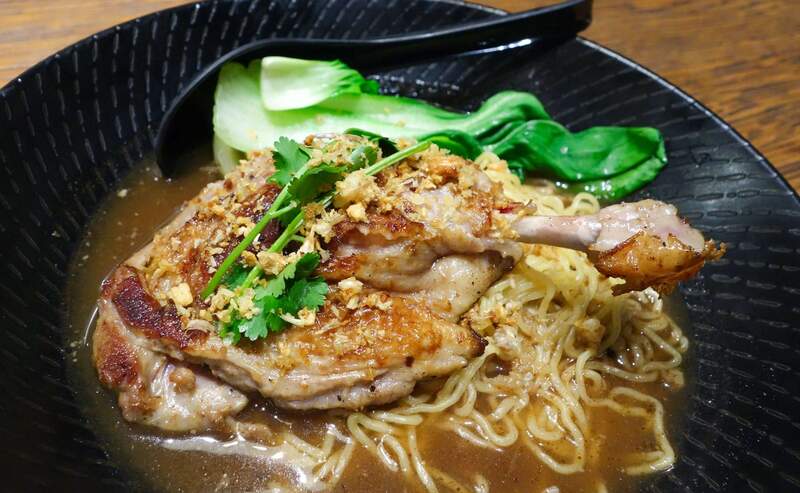 The restaurant serving traditional Thai cuisine with a slight Japanese twist. With Chef Oh having prior experience at Thai Pothong and Chef Kit at Sokyo. The restaurant is decorated to give a slight street feel. With repurposed furniture and stools. The staff were extremely welcoming and provide incredibly friendly service that the Thai’s are known for. 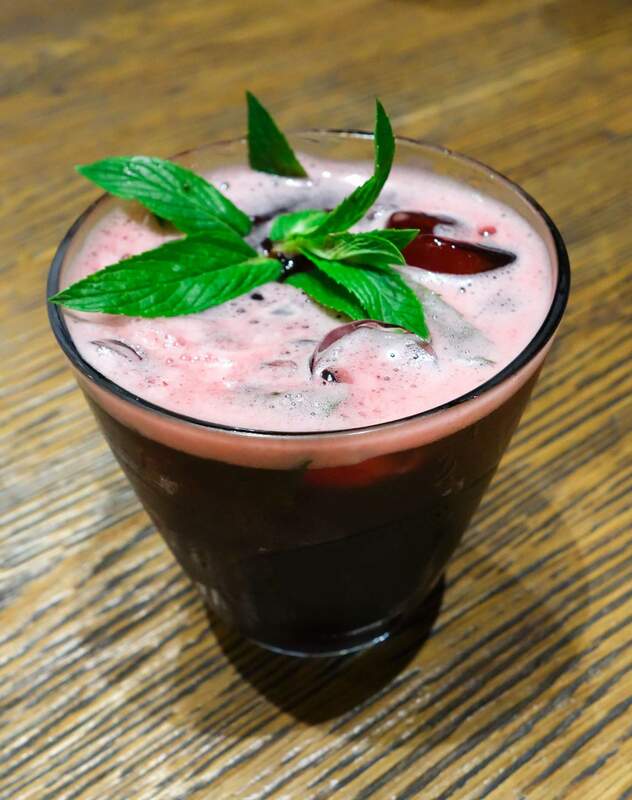 Ohbar has a range of drinks available including some innovative cocktails that will help ease the heat from the chilli. The refreshing watermelon Mojito was great, as was the popcorn pina colada. With a lot of passion and planning going into the menu, this was clearly evident in their dishes. The chefs travelling to all corners of Thailand searching for recipes that are local favourites, then bringing them to us here in Sydney and adding a Japanese twist for some added excitement. The menu offering more than your usual Thai, you will be sure to find something that excites your tastebuds. Thai cusine is known for its explosion of flavour and Ohbar definitely delivers on this. To start Mien goog is a great option, with this tasty moresil said to have 8 distinct flavours in 1 bite. A favourite was the Moo hong (Stewed pork belly) this dish had nice flavour and melt in your mouth texture. The blossom salad is a great option with a flavour bomb, with a mixture of all of the Thai cooking elements. A dish you probably wont find elsewhee is the Jumbo crab lump in thai basil sauce. We were informed that the crab lump is shoulder of the crab. In this instance all of the hard work already done with the shell already removed. Just enjoy the prized sweet crab meat and the flavours of the sauce. Oh and don’t forget dessert. I know you wouldn’t usually associate tiramisu and Thai, it has a light fluffy consistency and not too rich. 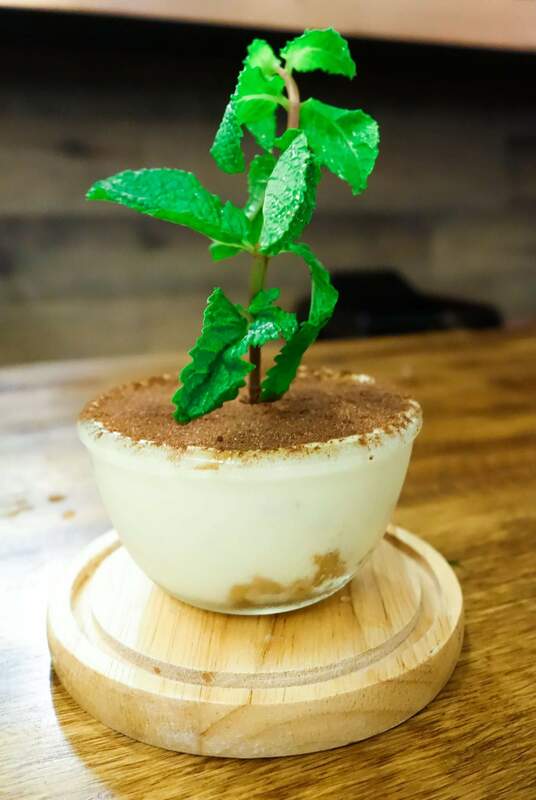 Named the tiramisu plant terrarium, the presentaion is fun with a spring of mint planted in the middle, making the appearance of a pot plant. 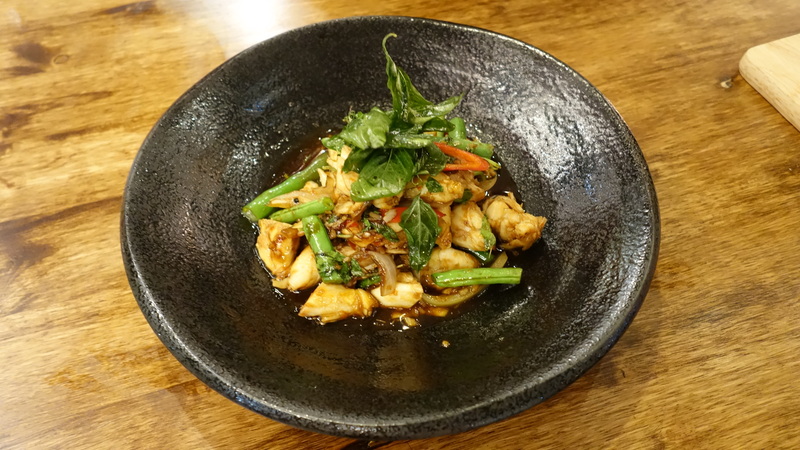 Not your regular Thai, but thai with a slight twist and some great dishes to choose from. Top that off with the welcoming staff and you have the recipe for a great Thai restaurant. 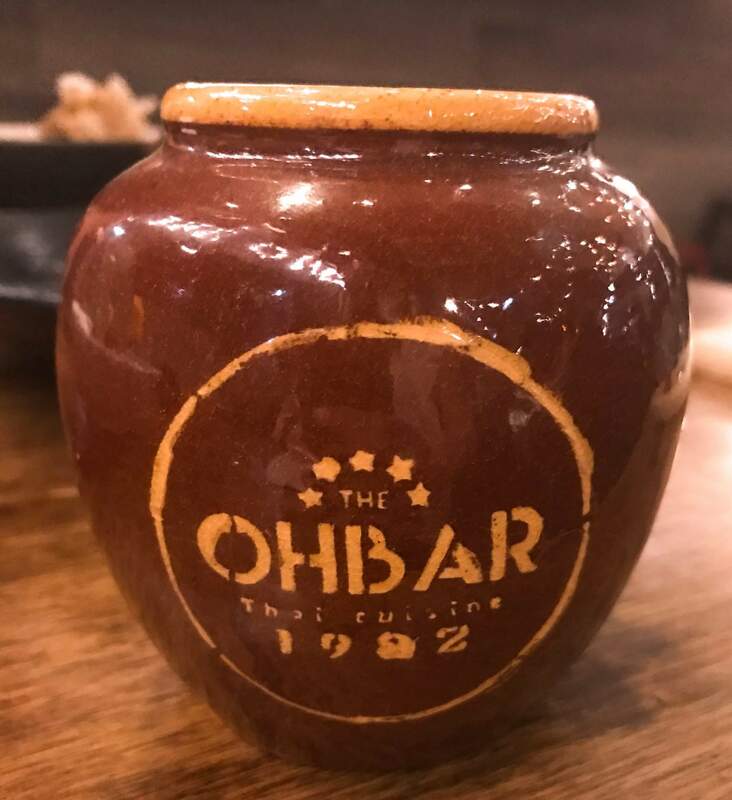 Be sure to check Ohbar out. When you go to a cafe called the Kindness cafe, you’re expecting a lovely place and really positive atmosphere. That’s exactly what you get! Quite possibly the nicest lady ever, Dusadee the owner takes us to our table and gives us a rundown of the concept. 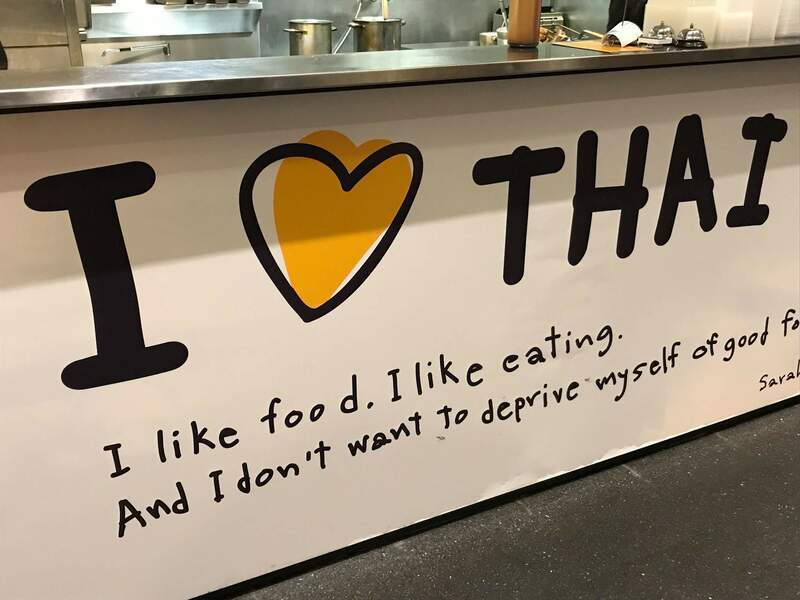 She wanted to deliver beautiful and delicious Thai food that was organic and doesn’t harm any animals in the process. That said, it is a vegetarian / vegan restaurant. Normally wouldn’t be our scene, being protein lovers, but we were completely satisfied. We had seen some beautiful pics of their famous corn fritters on Instgram and had to visit the Kindness Cafe. 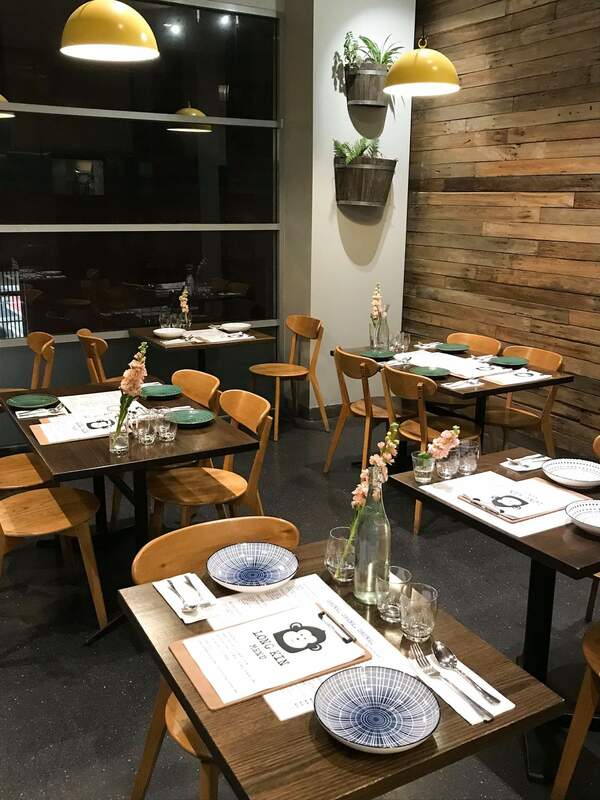 Situated in a nice little dining precinct in Darlinghurst with. Kindness cafe is situated between two extremely busy restaurants. 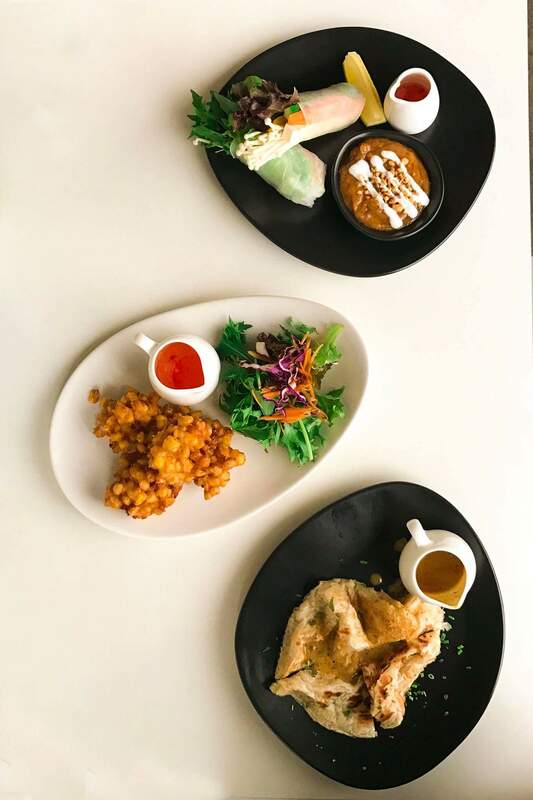 We tried a couple of starters – the wonderfully fresh rice paper rolls, with tofu, the corn fritters which the corn tasted incredible and some roti! Loved them. For the main, a delicious vegetable red curry named Thai garden. As expected with Thai it had some spice to it, but it was managable! 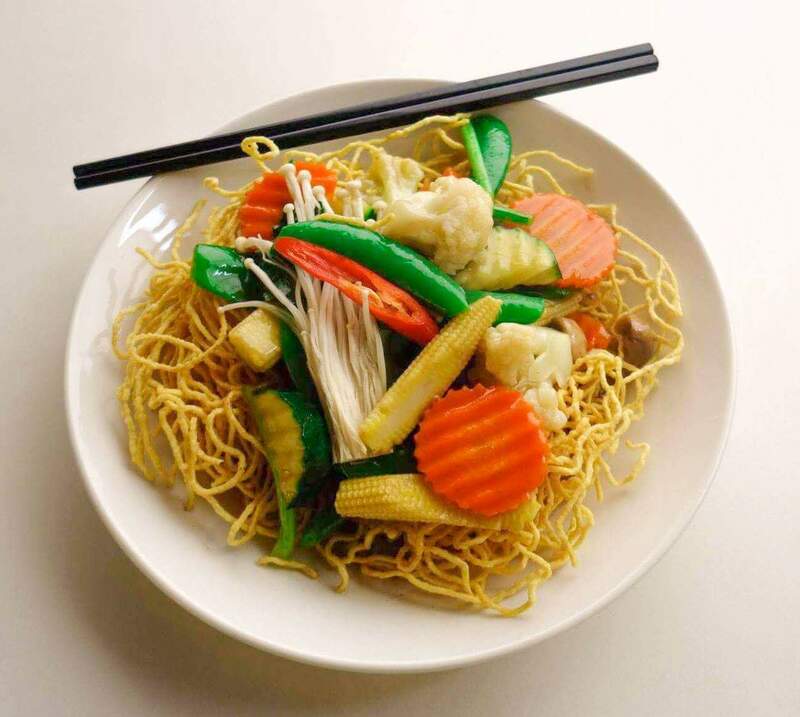 We decided to have rice and some awesome crispy noodles with vegetables aswell. They also have rice pudding and fruit for dessert. It is BYO and they offer delivery as well. The owners are lovely and really believe in their concept. We left fulfilled, worth a visit for some great Thai cuisine even if you are a carnivore.